National Hunger and Homelessness Awareness Week is November 10-18, sponsored by the National Coalition for the Homeless. 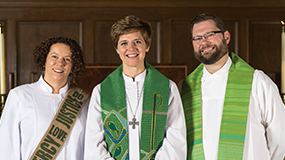 FUMC is spending all of November highlighting this pressing problem and working to raise awareness about the problem of hunger and homelessness. Help fight hunger by bringing canned goods to church! All contributions will be donated to Caritas of Austin, a local nonprofit working toward preventing and ending homelessness in Austin. With your help, the Caritas Pantry provides take-home groceries to families as people are transitioning out of homelessness. Together with their other services, food assistance builds a strong foundation as people work toward their life goals. When you are struggling to make ends meet and must choose between putting food on the table and paying the electric bill, weekly groceries bring great relief to families. Thank you for taking action in the fight against hunger. Together we can ensure people have healthy food as they rebuild their lives. Donations may be left in the collection bins located in the foyers of the chapel, sanctuary, and Family Life Center. Teams prepare sandwiches in our kitchen and take them to hungry people in Austin. Each third Sunday, we have a team open to first-timers of all ages to give this ministry a try. Volunteers may serve on the Make-Ready Team (4:00 to 5:00 p.m.), the Truck Team (5:00 to 6:30 p.m.), or both! Sign up at fumcaustin.org/mlf. Our fourth and fifth graders show the love of Christ to those in need through the making and selling of Manna Bags. These bags are filled with a nutritious meal, a new pair of socks, and a note asking for God’s blessing on the recipient. You may purchase a bag for $5, with proceeds going to purchase more supplies. Come experience this ministry that serves breakfast to 300 of our homeless guests. To volunteer, preparing, cooking, and setting up begins at 4:45 a.m.; serving begins at 6:00 a.m.; and clean-up begins at 7:00 a.m. You may arrive and leave to meet your schedule. On-the-job training is available. During the winter months, FUMC provides shelter for up to 25 women on Tuesday nights when the predicted overnight low is expected to be 35 degrees and wet or 32 degrees and dry. We have shifts to welcome and greet our guests, provide/serve dinner, and act as overnight hosts. Sign up here. ThunderCloud Subs and thousands of participants for Austin’s favorite Thanksgiving tradition. The ThunderCloud Subs Turkey Trot features a five-mile run, one-mile walk, and a Kids K. One hundred percent of the proceeds are donated to Caritas of Austin. Sign up to volunteer or participate here. Each year, the Ending Community Homelessness Coalition (ECHO) plans and leads the Point in Time Count, an annual census of people experiencing homelessness. Data from this census contribute to local and national efforts to end homelessness. Over 500 Point in Time Count General Volunteers will cover all of the Travis County geographic area at a single point in time to talk with persons experiencing homelessness to conduct a survey that helps ECHO better understand the scope of unsheltered homelessness in our community. All volunteers must be at least 18 years old. ECHO is a coalition of stakeholders that plans, develops, prioritizes, and implements systemic, community-wide strategies to end homelessness in Austin and Travis County. Let’s join ECHO in this critical activity for understanding and planning homeless services in Austin and Travis County. Together, we can end homelessness in our community! Learn more and register here http://www.austinecho.org/pointintime/. 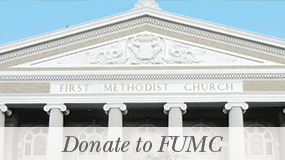 Please contact Pastor Cathy Stone at cathy@fumcaustin.org or 512-478-5684. Join ECHO for their Fall Meeting to celebrate our community’s successes of 2018 and explore what’s in store for 2019. The Ending Community Homelessness Coalition (ECHO) envisions a community fiercely committed to ending homelessness. Providing dynamic, proactive leadership that engages policymakers and the community to end homelessness. For more information about ECHO and to register for this meeting, please visit austinecho.org.